Silver maple bark is often thin and peeling. Photo by Pablo Alberto Salguero Quiles. Silver maple trees grow to be 60-120 ft. tall and can live for 130 years or longer. They generally have short, thick trunks with spreading, irregular crowns of branches. The species grows naturally in most of the eastern United States, avoiding the Atlantic and Gulf coasts. Generally shade intolerant, these quick-growing maples are quick to invade cleared areas. 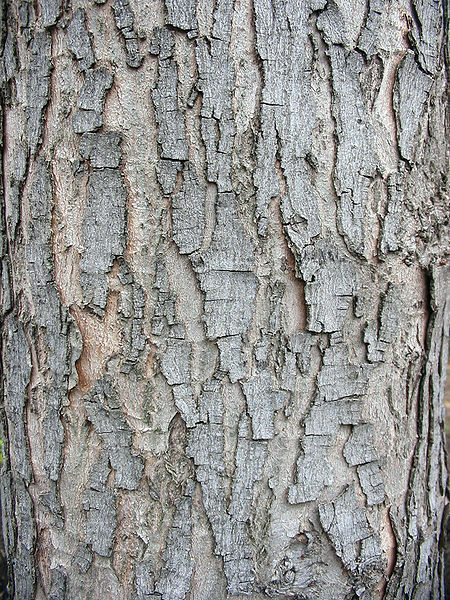 Their bark is gray and very thin; on older trees, the bark grows into shaggy, scaly-looking ridges. The top of a silver maple leaf. Photograph by Kristian Peters. 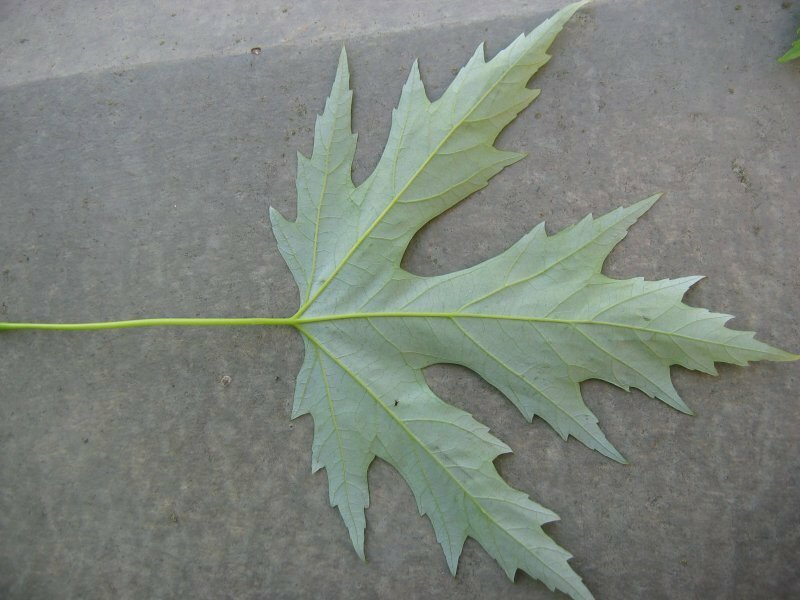 The leaves are simple (meaning they are not divided into parts), deciduous, and grow opposite each other to be 4-6 inches long. 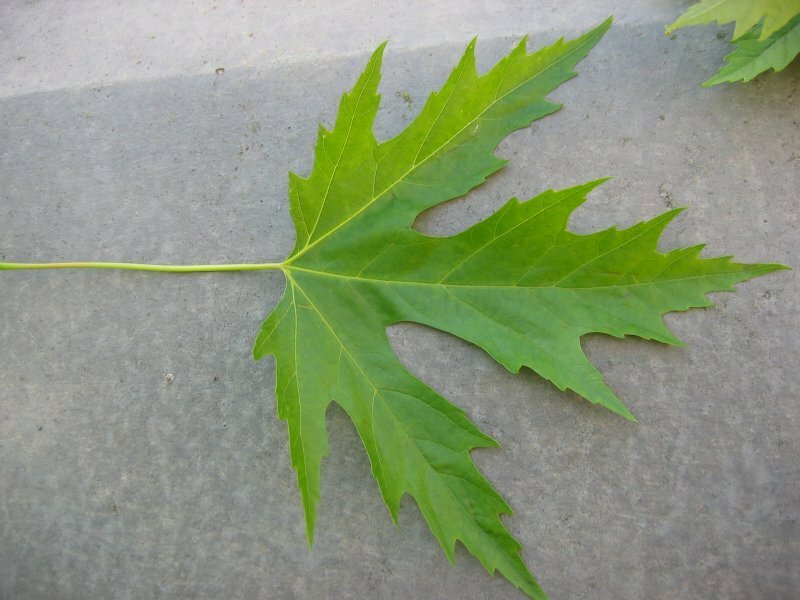 Acer saccharinum leaves are easily recognizable, five lobes with very deep sinuses. The large middle lobe is often three-lobed as well. In autumn, the leaves turn gold. The bottom of a silver maple leaf. Photograph by Kristian Peters. The entire tree flowers simultaneously before its leaves grow, usually in March or April. The large, dense clusters of buds lend a reddish tint to the entire tree (excluding the trunk). Most silver maples have flowers that are all one gender (monoecious), although some trees have both male and female flowers (dioecious). Interestingly, some trees are capable of producing different-gender flowers in different years. The samara is the fruit or seed of a silver maple. Photograph by Kristian Peters. Fruiting, the production of samaras, occurs anywhere from April to June, maturing three weeks after pollination. They can grow to three inches long—the largest seeds of any native maple. The double-winged samaras droop rather than growing flat like the samaras of the Norway maple. 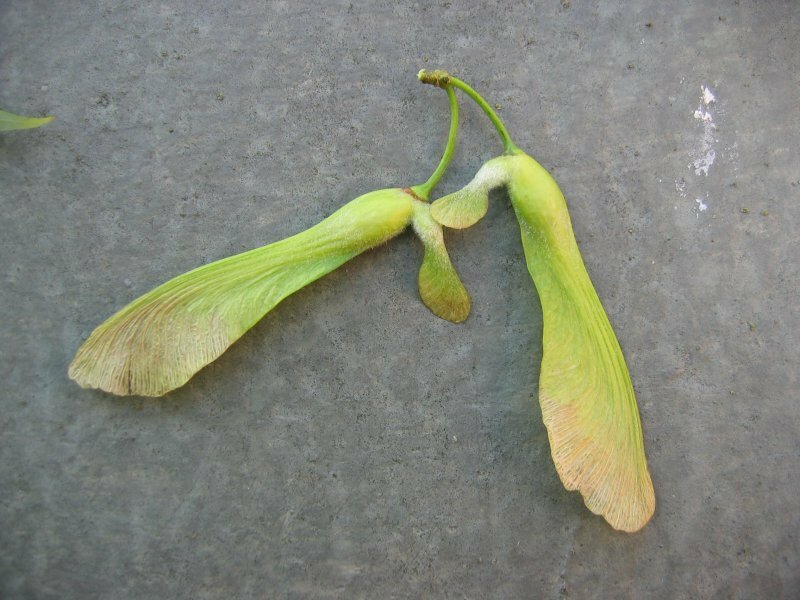 Silver maple seeds are primarily dispersed through wind, occasionally moving through water as well. This Omeka collection is hosted by The Center for Teaching and Learning at the University of Vermont.